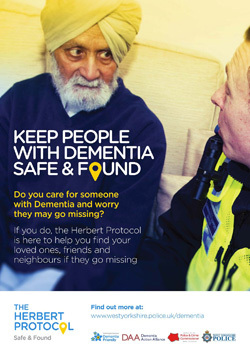 The Herbert Protocol is an initiative introduced by West Yorkshire Police and other agencies which encourages carers to compile useful information which could be used in the event of a vulnerable person going missing. Carers, family members and friends can complete, in advance, a form recording all vital details, such as medication required, mobile numbers, places previously located, a photograph etc. 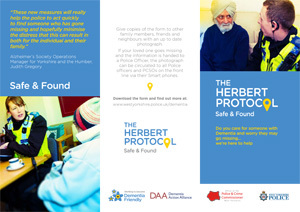 In the event of your family member or friend going missing, the form can be easily sent or handed to the police to reduce the time taken in gathering this information.